I’ve been deployed to the Middle East several times and for most of them, I’ve noticed that a certain sports entertainment program loves to be shown on the American Forces Network, or AFN for short. AFN is a television and radio network service operated around the world where American Armed Forces are located. I remember watching little bits of AFN as a kid in Germany, and I’ve seen or heard AFN plenty of times when I was in the Middle East and South Asia. They also have a presence in Europe and the Far East. That sports entertainment program belongs to World Wrestling Entertainment, or WWE. I used to watch WWF as it was known back then when I was a kid; my brother and I ate it up. But I stopped watching wrestling when I joined the Army and didn’t get back into it almost two decades later when I learned that the WWE would send some of their wrestling superstars out to the Middle East as a part of several morale boosting tours. I watched WWE shows, to include pay-per-view events, on AFN while treadmill running during deployments when I couldn’t run outside. I ran six or more miles with those WWE shows on; I knew wrestling wasn’t real, but I could appreciate the athleticism, stunts, and work ethic. The only drawback to the WWE’s shows were the one day delayed broadcasts, but when you’re deployed, does it really matter? A few years ago, my brother informed me that the WWE had a program which allowed military members and their families to attend live shows for free. You can read about more about it here (https://www.wwe.com/military/free-military-tickets). 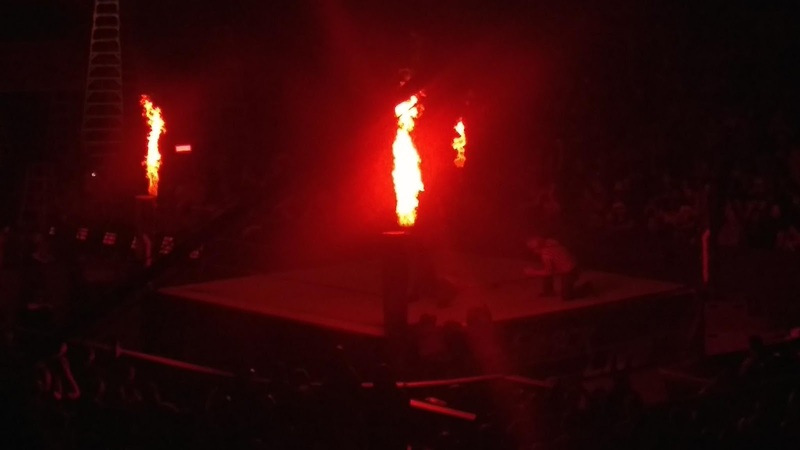 I’ve taken my family to four different shows in three cities and can relate what I learned if you want to take advantage of WWE’s program. It is a good program if you want to see a top quality wrestling but there are a few caveats to be aware of. 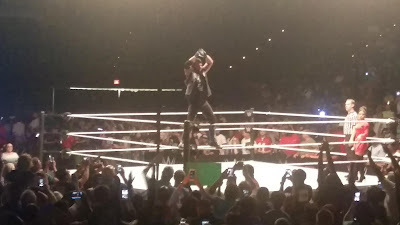 The first place I took my family to was in Augusta about two ago for a WWE Live house show. 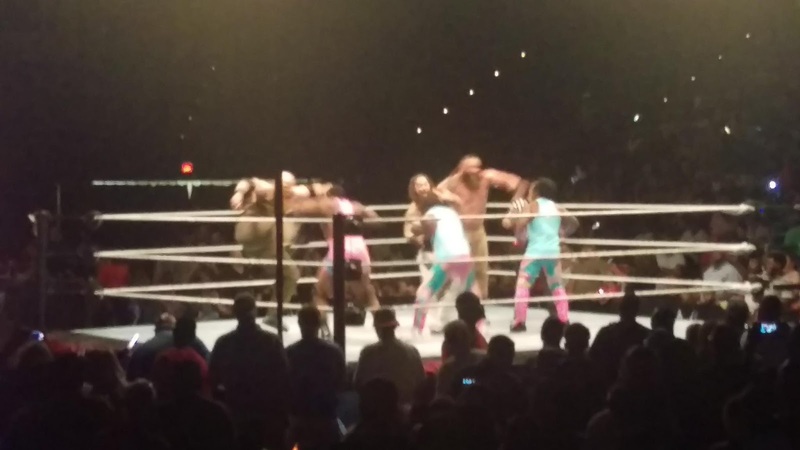 The James Brown Arena can host up just over 9000 people but as with most WWE shows I’ve seen on the television, there are some sections that go empty and get covered up (more on that later). Also, Augusta is where I first learned that everyone in your party has to have a military ID card to get in for free. While my older two and I had a military ID card, my youngest did not because the military won’t issue an ID card to children under 10 years old unless the military parent is divorced or single. So, out of the four of us who went, I only had to pay for one ticket, and even then, the arena charged me for a child’s ticket. 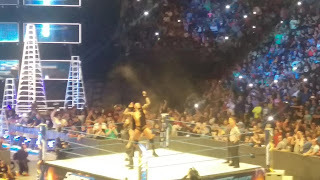 The James Brown Arena also picked out the seats for us, even before I had to buy my daughter’s ticket, however, we had a fantastic view of the New Day, Alexa Bliss, Sami Zayn, Kevin Owens, Sheamus, AJ Styles, and Roman Reigns. My phone didn’t take great pictures, but the overall view was phenomenal. 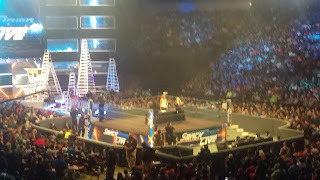 The second time I took advantage of the WWE military program happened when WWE’s Smackdown came to Columbia last year. Again, I had to buy my youngest child’s ticket, and again, the ticket distributor picked our seats for us. The Colonial Life Arena can host up to 18000 people but since this was a Smackdown Live show, several upper sections had black screens places over them to corral people into the background on the TV broadcast. 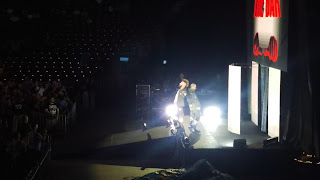 I loved watching the show in the Colonial Life Arena because even though we sat in one of the upper sections, we again had a great view of the show and saw Becky Lynch, Charlotte Flair, Dean Ambrose, Randy Orton, and Kane. The sections in that arena are not stacked as vertically as other arenas, so you don’t feel far from the action. The third time I went to a WWE show, I took only the youngest and she was shy of her 10th birthday by a month. 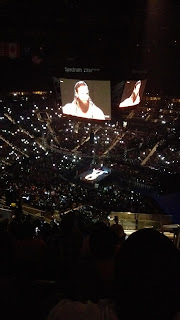 Not thrilled about buying a ticket that WWE said would be free, but I am presuming that because this was a WWE Live house show, aka not a televised show, we actually had a chance to pick any open seat available to include seats right along the ring. I would still have to pay for my daughter so we chose a cheaper seat. Being that this happened at the Colonial Life Arena again, just about any seat available had a very great unobstructed close view of the WWE superstars and the squared circle. Shinuske Namamura, the King of Strong Style. The house show's audience was about half full. The latest opportunity I had for a WWE show happened in Charlotte for WWE Raw. My two daughters and I drove up there with time to spare and since my youngest was now 10 years old, all tickets requested would be free. 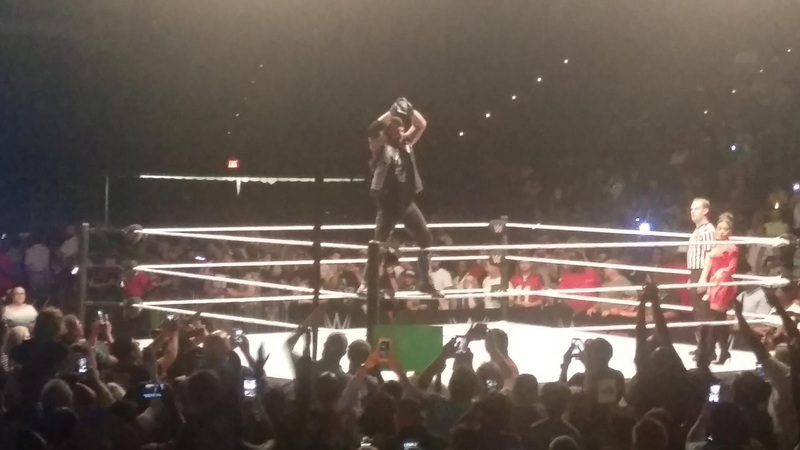 WWE Raw took place at Charlotte’s Spectrum Center which can hold as many as 20,000 people in the stadium. We asked for our tickets and the staff issued us three tickets for section 223. 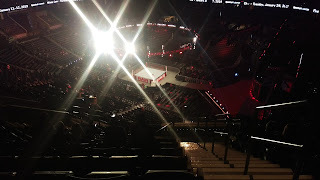 The Spectrum Center’s upper sections are pretty high up and while we had a nice view of the arena, the actual wrestling ring looked somewhat diminutive compared to past experiences. Fortunately, a very giant screen broadcast the action that the home viewers would see above the ring. 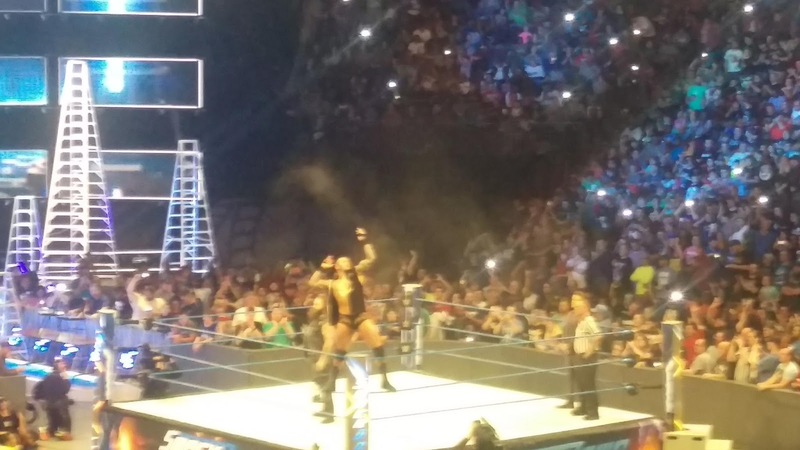 While the wrestling action looked smaller than what we were used to, the sounds carried through probably because the backstage crew places microphones under or near the ring to pick up the sounds of body slams, slaps, and falls. 1. Free tickets are available the day of the event to anyone holding a military ID card. This includes active duty military, National Guard members, reservists, retired personnel, and military dependents. 2. 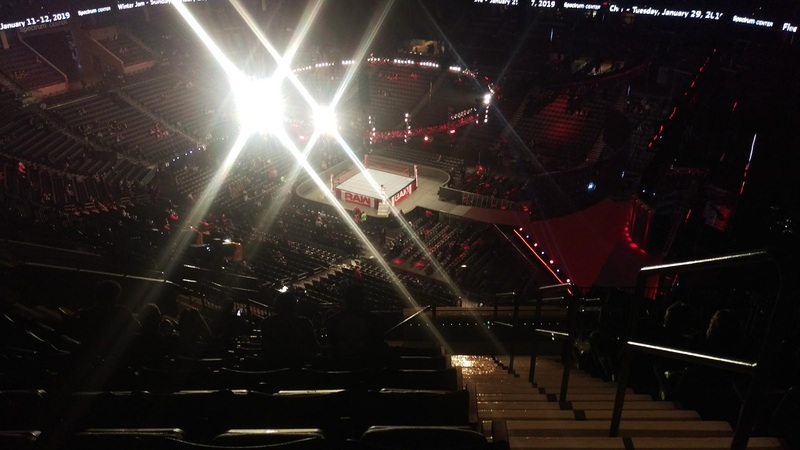 Each venue will determine where you sit, especially if the WWE is taping at that event, though you may have some leeway on which seats in a particular section. 3. 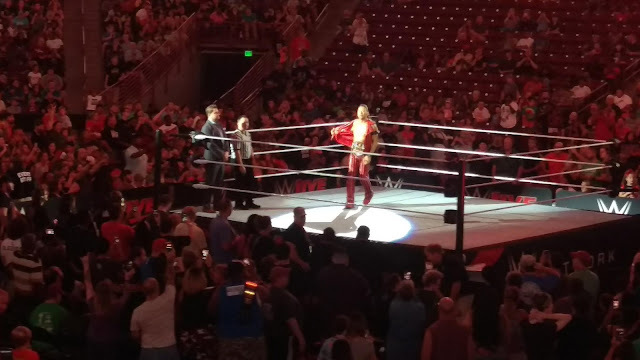 However, it is possible that you can get a great seat, especially along ringside, if the WWE show is a non-televised event, but this depends on the venue. 4. WWE gives the military free entry to every event but WrestleMania. I haven’t tried this at any pay-per-view shows, but I can confirm that you can get in televised Raw tapings, televised Smackdown Live shows, and normal house shows. 5. WWE will have some of their superstars visit military bases overseas though the frequency has gone down as conflicts and military deployments decreased over the years. WWE can be a polarizing organization these days and there are also people out there who look down on something that is fake, but there is an enjoyment to be had watching these people in person.